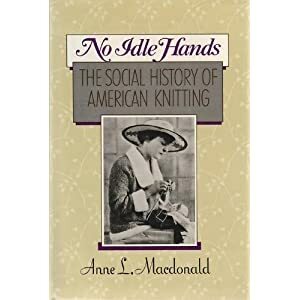 When I began this blog, I called it "No Idle Hands" -- taken from both the proverb ("Idle hands are the Devil's workshop") and from a book of the same name by Anne L. Macdonald -- subtitled, "The Social History of American Knitting". It's quite the tome, and I confess I still haven't read it! Later, I changed my blog title to "The Lady Who Knits on the Bus" -- my nickname at the time, given me by one of my fellow-commuters, who was fascinated by the way I passed the 1/2 hour or so to and from work every day. 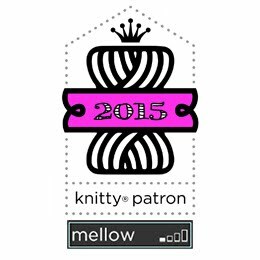 "The Lady Who Knits on the Bus" was also my blogger URL (before I registered my name as my domain) and the initials TLWKOTB are still part of my signature whenever I check into Clara Parke's Knitter's Review Forum. 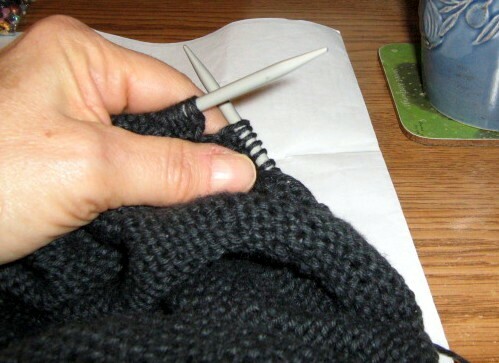 I learned to knit over fifty years ago and despite all the quilty goodness you see going on on this blog, knitting remains my first love. I rarely pass a day without knitting, and there is always some in my tote. That's right: tote. I don't carry a purse; I carry a knitting bag with a wallet in it! Currently I'm working on UFOs with great intention. In my hands at right is the body of a camisole, knit in one piece from the bottom up. The yarn is 'Desire' from Diamond Yarns -- bought long enough ago that it's now discontinued. It's a yummy blend of 75% silk and 25% cashmere, and I must have bought it at a discount from Elann.com, or I doubt I could have afforded it! The pattern is "Silk Camisole", found in Last - Minute Knitted Gifts by Joelle Hoverson; the bookplate I put in the front shows I bought it in 2004. Heaven knows how long ago, then, I got the yarn and began the cammie! A pristine copy of knit wit: 30 easy and hip projects by Amy Singer, beloved founder and editor of knitty.com. All comments from Week One have been dispensed with; it's time to start afresh. As before, all comments to this blog post and to every post between this one and 8 a.m. Friday, February 22 will be eligible for entry into this give-away (even if you comment more than once). I was also known as "the lady who knits on the bus" before my office relocated and now I drive. I was proud of that name. I am so proud of you - I completely let my 10 year blogaversary go by the by. I'll have to wait till the 15th. It seems a long time ago, doesn't it? Good for finishing UFO's. I have some lovely treasures in my stash also. Also have passed one year of "no yarn buying" to use up stash (except for yarn for Master Knitter Program--nothing in stash for that). Congratulations on your 10th Anniversary. I discovered you through Knitter's Review forums. Your story in your About section was actual rather inspiring. Kudos on embracing your creativity. I am starting on backreading your blog and am admiring your beautiful works of art. Congratulations on your 10th Anniversary. 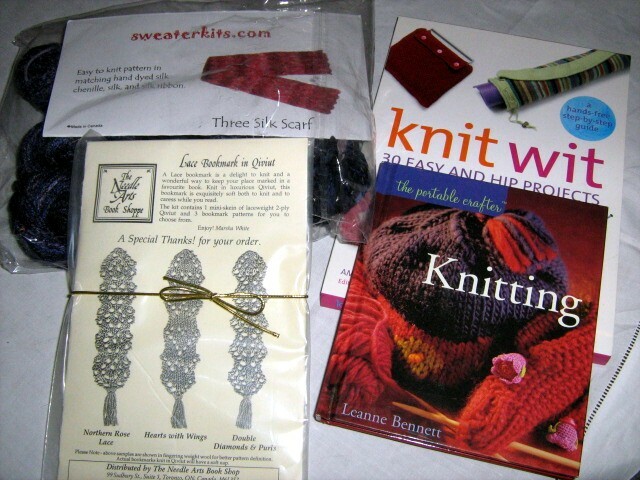 I "discovered" your blog through your comments on Knitter's Review forums. I've enjoyed reading your blog posts. Your story as noted in your About section was inspirational. Kudos on nurturing your creativity. WOW what a milestone. Congratulations. This is the first time I have commented but I have read your postings every now and again. Totally commenting on this one! Cold weather always seems like knitting weather. Sitting in front of the TV with no idle hands. Little by little, and an item gets finished. Congratulations on ten years of blogging. That is a real accomplishment! I agree with the 'no idle hands' sentiment. If I could take a bus to work, I'd get a lot more knitting done. 10 years! Congratulations!! That is quite something. That also mean that it took me all that time to make my journey to your blog. I am happy to have discovered it, and I will stay tuned! Congrats on 10 years. Saw your post on Ravelry. I couldn't understand how anyone could tolerate a 12 hour commute. Had to read it 3 times. The perils of trying to read before my first coffee of the day. Congratulations on your anniversary! Congratulations on ten years. To celebrate it with fun gifts is a great idea. I need to go figure out how long my blog has been going. I will check in now from time to time, having been lead here from Ravelry. Congratulations on ten years of blogging. Just found your blog! Happy 10th Anniversary! I have to say that knitting is therapy!